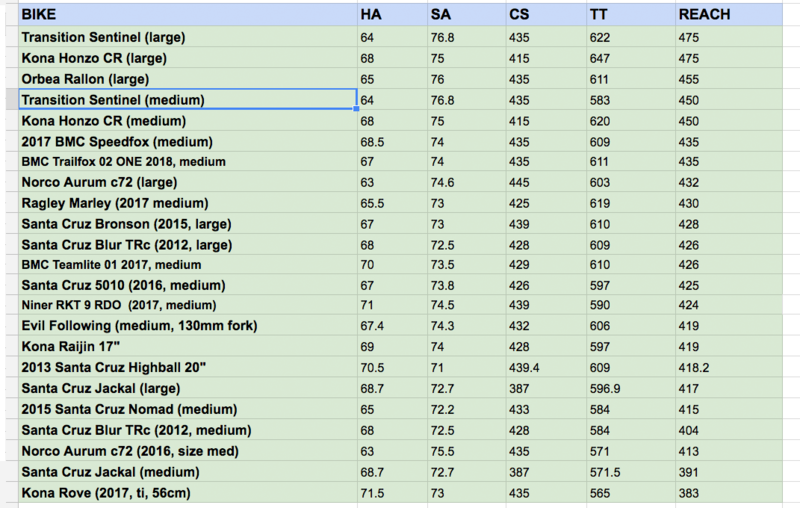 What’s size bike should you buy? It depends on your preferred reach. Buying the correct size mountain bike used to be easy. For me, being near an average height of 5’10”, a size medium bike was generally the right choice — sometimes. It turns out at 5’10”, I fall between a medium and large for a number of brands size recommendations. It’s been a struggle at times to determine the ideal frame size. Only a few years ago, stand over height was still a major consideration, so medium was often the choice in order to run a longer dropper post. 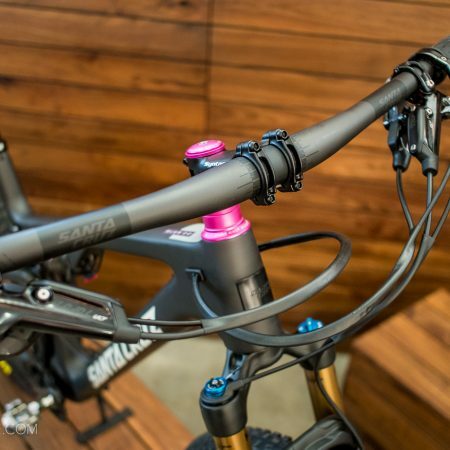 Fortunately, bike manufacturers have all wised up; sloping top tubes with plenty of clearance are common from almost brands now, allowing riders to choosing their fit via frame reach. 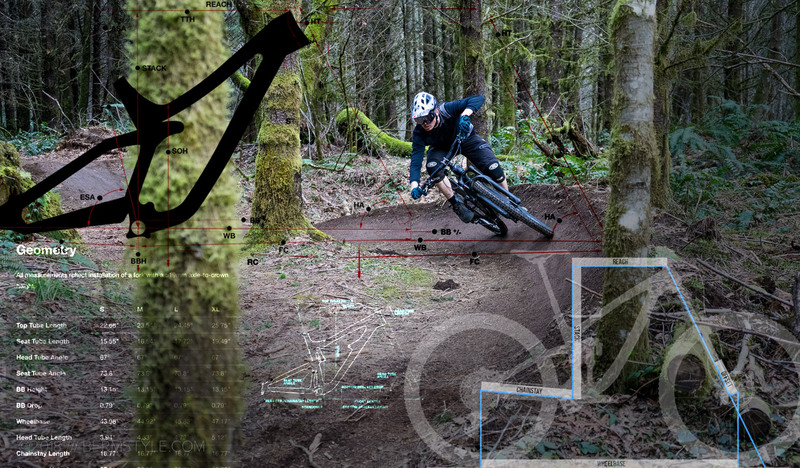 With contemporary mountain bike fits, the primary measurement utilized for sizing mountain bikes is reach. Previous to the establishment of reach as our primary metric, top tube length and “effective top tube length” were used for determining one’s size. (That, and you needed to be able to stand over the thing.) Thankfully, things have come a long ways. While still utilized for road bike fits, with modern sloping top tubes and a wide range of seat tube angles, we’re more concerned about how the bike handles when you’re standing on the pedals. Using the reach metric paired with rider preference in stem length, we can use the numbers as a starting point for deciding the ideal frame size based on the riders preferences and riding style. To make it simple, shorter reach equates to a bike easier to maneuver, whip or spin, while a longer reach adds high speed stability. The reach on these bikes is all over the place. Figuring out my preferred fit (and when I say fit, I mean reach) has been a bit frustrating at times, but this year things seem to have clicked, and my current full suspension trail bike — a size medium Transition Sentinel — is totally doing it for me. Thanks to access to industry pricing, (AKA pro deals or bro deals if you will) I’ve splurged on carbon fiber frames, only to lose out on my investment when it came time to move on and try a different frame, wheel or frame size. I’ve also purchased the same model bike more than once now, in different sizes, trying to find that “just right” fit. My current trail bike fits in the long travel 29er category, though I just call it a trail bike. With 140mm of rear wheel travel and 160mm of squish up front, it isn’t a full blown enduro rig, and it blurs more lines between categories than any bike I’ve owned. It features the slackest head angle of any trail bike I’ve owned to date but it’ll still climb up anything thanks to the 76.8º seat tube angle. Upgrading the stock wheelset to Reynolds TR 309 Carbon wheels has given the bike a nimble, playful feeling it has no business possessing, and utterly transformed the riding experience. It’s important to recognize what I find “playful” in the context of a 29er might be different from yours. I’m currently rotating back and forth between the Sentinel, my Norco Aurum downhill bike, a Kona Honzo (size large) and a Santa Cruz Jackel dirt jump bike. The Sentinel works best going fast on trails, and in this context it is super jibby and playful… compared to the downhill bike. 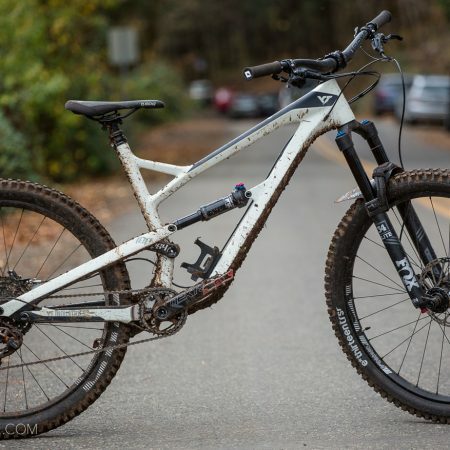 I’ve always enjoyed riding and racing DH bikes though, and the Sentinel brings this experience to a trail bike that also excels climbing back up hills. The geometry is a huge part of this, but much of it can also be attributed to the light, stiff carbon wheels. Choosing the size was the hard part though, and it kept me up at night. Once again, according to the manufacturers size charts, the recommended fit for me at 5’10” was right in the middle of the size medium and size large. Taking into account the reach of the small was already longer than the bike I was coming off of — and I rarely do this, but based on previous regrets, I asked around. One rider, extremely vocal of his opinions pushed me hard towards a size large, with a massive 475mm reach. Moving to a size large would mean I’d be riding a bike with a reach 55mm longer than the bike I was on at the time. It sounded.. well, horrible. After all, it was just a few short years ago I was happily riding a bike with a 404mm reach. A back and forth ensued, with him referring to blogs posts he’s written like they were gospel. However, he wasn’t interested in listening to or taking into account the type of trails we ride in the PNW, or rider reference. The 450mm reach size on the medium Sentinel with its 29″ wheels been great fun everywhere I’ve ridden it this year. Stable at speed while still being a ton of fun in the air. His input was enlightening though, and added additional perspective. In fact, I’ve since added a bike with that massive reach to my quiver. Let me put a pin in that for a moment though. During the final moments of my acquisition process, I called Lars at Transition and hashed out my concerns. I already felt the medium size was the right call, but I needed input from a rider that had ridden the bike the way I wanted to ride it. Although I don’t know Lars well, we’ve ridden bikes on trails at least once, and I like to think I ride in a similar fashion. Based on the experience I was looking for, the bikes I had ridden before and my preferred stem length, he recommended the size medium with its 450mm reach. This was 30mm longer than the Evil Following I was coming off of. I started with a 50mm stem, but then went a bit shorter to a 40mm and haven’t looked back since. After a few months of riding the Sentinel as my primary trail bike, it’s influenced how I feel about the fit on the other bikes I’ve owned. Not only am I sold on the 29″ wheel platform for my primary trail bike, but I’ve been slowly selling all my other bikes in order to replace them with longer frames. I went from a medium Blur TRc to a large, and back to a medium over the span of two seasons. Looking back, I went through quite a few bikes in the search for my ideal trail bike. 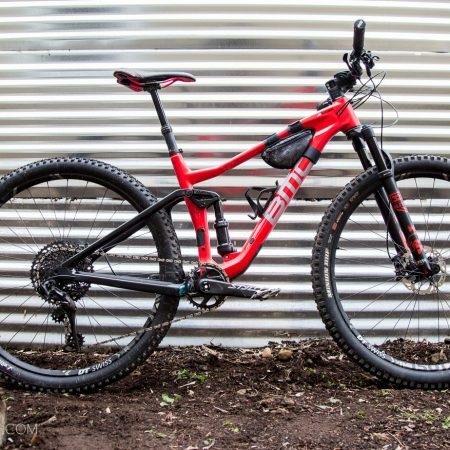 Before 29er geometry was to a point it was something we actually wanted to ride, we stuck with 26″ wheels, and then migrated to 27.5″ as it was introduced. From 2012-2016 I primarily rode Santa Cruz models, as they were a great choice for the up and down trail riding of the Bay Area. For a long time, my favorite go-to model was the Blur TRc, featuring 130mm of rear wheel trail. I paired it with a 140mm fork, long forking it in what is much more common with bikes today. (I also owned a Nomad, but the old Nomad had a slack seat angle that discourage charging up climbs) The Blur was a fun bike, cranked up hills and stable enough on the short descents found in the Bay Area. The downside? The medium with its reach of 404mm felt very short, so the next season I replaced it with a size large which had a 426mm reach. The fit was improved and felt more stable, but I missed the nimble feel of the medium. Santa Cruz bikes in 2012 didn’t provide a lot of room for dropper posts yet either, which caused frustration, as I had to try every trick in the book to make a 5″ post work. I ended up going back to a medium TRc, and swapped the large out for a medium again. In hindsight, with small nimble wheels, I prefer a smaller nimble feel. Fast forward to 2018, and my 26″ wheeled Santa Cruz Jackel medium size dirt jumper now feels too small. (especially coming off the Sentinel) I currently have a large Jackal on order, and I’m hoping the 417mm reach of the large feels better. But that’s with 26″ wheels. I’ve also swapped my size medium Norco Aurum DH frame with its 650b/27.5″ wheels (413mm reach) out for a size large (432mm reach) and am loving it. 2014. 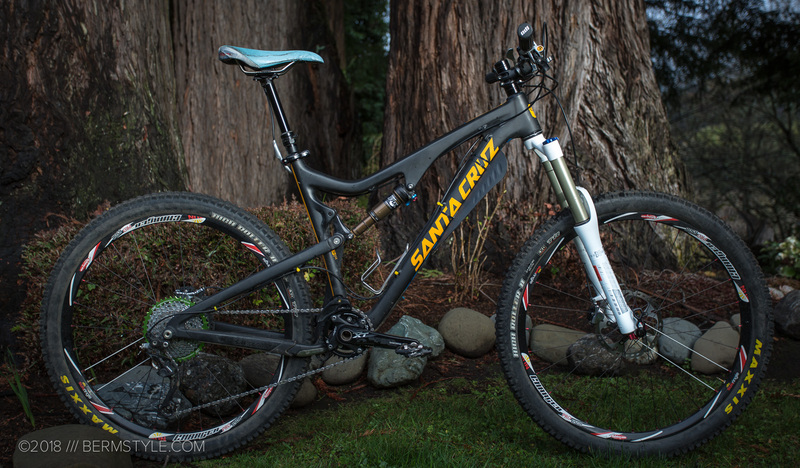 My Santa Cruz Bronson, size large had a 428mm reach. 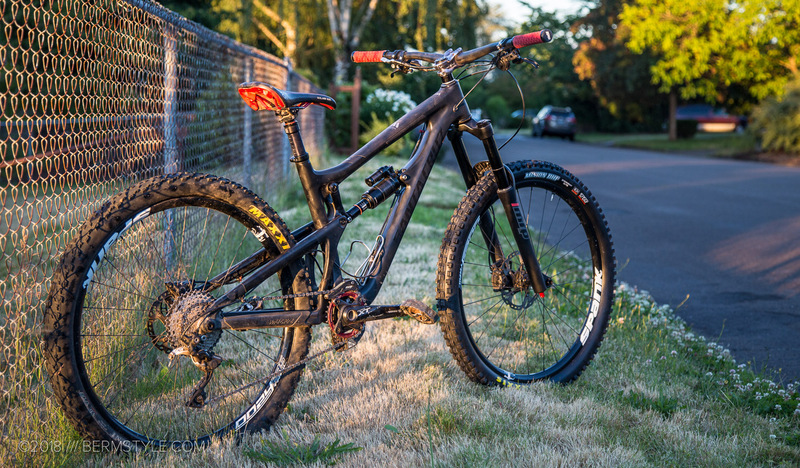 The following year the Bronson was released, with 27.5″ wheels. The seat tube issue I had with the TRc had been addressed somewhat, and I was able to fit a 5″ dropper on the large so I moved back to the bigger frame. The 428mm reach felt long to me a the time, and while I liked the stability, I had a hard time keeping weight on the front tire when I was tired and my form got sloppy. I ended up replacing the large Bronson and going back to a medium Nomad. 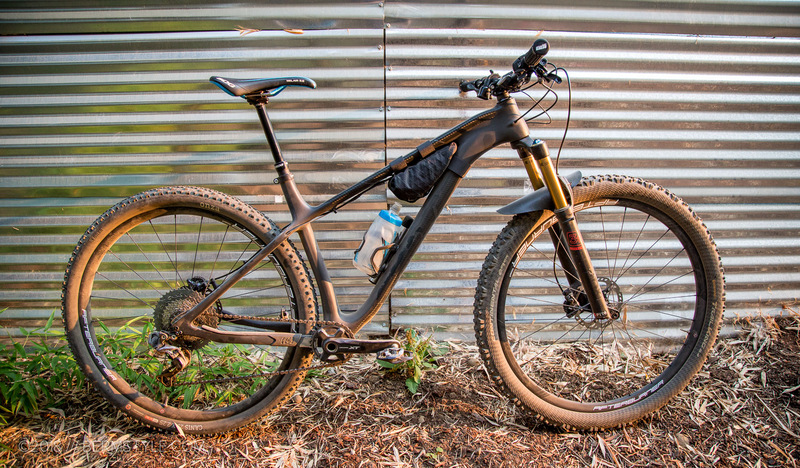 The new Nomad had just been released and the updates to the geometry fixed practically everything with the old one: slacker head angle, steeper seat angle, plus it pedaled better to boot. And it finally had a water bottle cage! On my first ride I two wheel drifted a flat turn after less than a few minutes on the bike, and the feel of the bike just felt perfect. For years I was my favorite bike; I still have it. 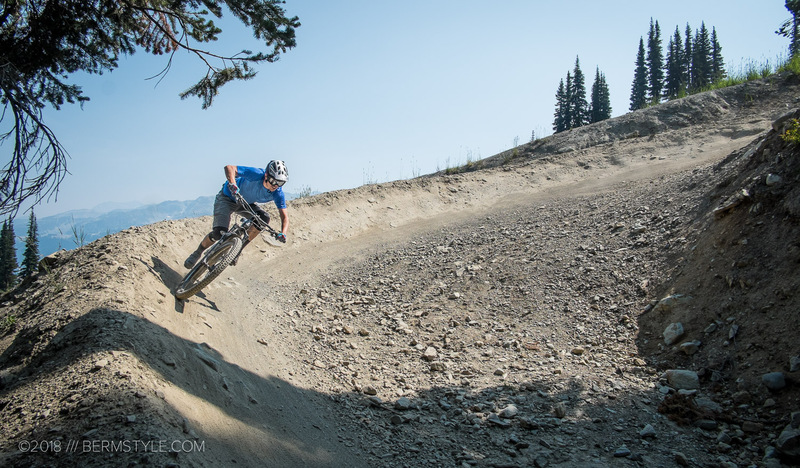 I’ve ridden the Nomad everywhere from double black diamond trails at Whistler – both the jump trails and gnar — to 26 mile back country missions, and liked it so much I didn’t feel the need to own a DH bike anymore. While I couldn’t go as big and stopped sending large DH rated features on it, it turns out I had more fun on the bike than my Driver 8 and then Demo 8, so I when I sold my Demo 8, I didn’t replace it. Eventually I up-forked the Nomad and decided I wanted something with less travel for longer XC-type riding. Looking to replace the Blur TRc I tried so hard to make work, I went with a new 5010 in a size medium. It was just like the Blur, but better. And this time, with a reach of 425, it matched the large TRc I had, but most importantly, I could run a 6″ dropper post. I was often torn on the 5010. While it would have been perfect for playing on the trails I was regularly riding in the Bay Area, our trails in the PNW were faster and steeper, with a lot more variety in terrain and difficulty. I found myself loving the 5010 for long XC rides where I would have previously taken a hardtail, but I would go back to the Nomad for anything with lot of jump lines. Then one day I tried a friend’s Evil Following in the parking lot and that was all it took to convince me to make the switch. The Following was as fun as the Nomad on jump lines but somehow, even with 29″ wheels, it was even more playful, while feeling faster on most of my usual rides. It pedaled close to the 5010, but on any descent short of a full blown DH trail, felt like the Nomad. The big wheels had so much traction in corners that I was railing berm-to-berm lines brakeless and I was surpassing my previous limits. After years I scoffing at the wagon wheels, I was sold. The Following had two problems though. The seat angle felt too slack. I also wished it was just a tad longer. The 419mm reach felt short to me for some reason, and I found myself running 60, then 55mm stem to make it work, when I would have preferred a 40-50mm. I also wished it had just a bit more travel. It almost felt like I had two enduro bikes, except one was lacking in travel. I used to buy a new bike every season. Pro deal and industry pricing is part of the perks of being a poorly compensated worker in the bike industry. These days I keep foot in the door of the industry to keep access to discounted product but the reality is that my expensive taste in carbon fiber hurts my bank account. One of the reasons I used to be able to get new bikes every year is because I’d buy the less expensive alloy model with the price point build kit. Having top level dampers in your suspension and a good set of brakes is far more important than whether or not your frame is plastic or aluminum. A lot of people buying used bikes don’t want a used carbon bike – there are far too many horror stories of broken frame floating around out there, (read the Evil Bikes Facebook group for example) and you don’t get a warranty when you buy used. If you’re not sure, getting a less expensive alloy frame makes more sense. If you love it, you can always upgrade to the lighter bling later. I wish I could draw a conclusion here but my preferred reach length is longer than it used to be for trail riding, I’m finding my preferred reach is still rather broad. As you’d expect, it changes based on the primary riding experience for the bikes. A bit shorter for bike park and dirt jumps and longer for trail and XC. I recently changed out my size medium (413mm reach) Norco Aurum DH bike to a large(432mm). 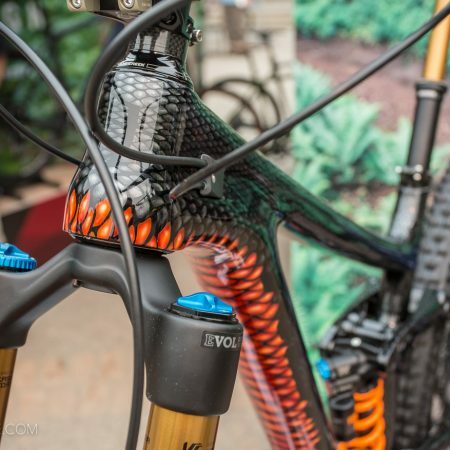 Other aspects of the bike’s geometry obviously come into play as well. While my preferences have changed some over the years, but the trails I like to ride haven’t. 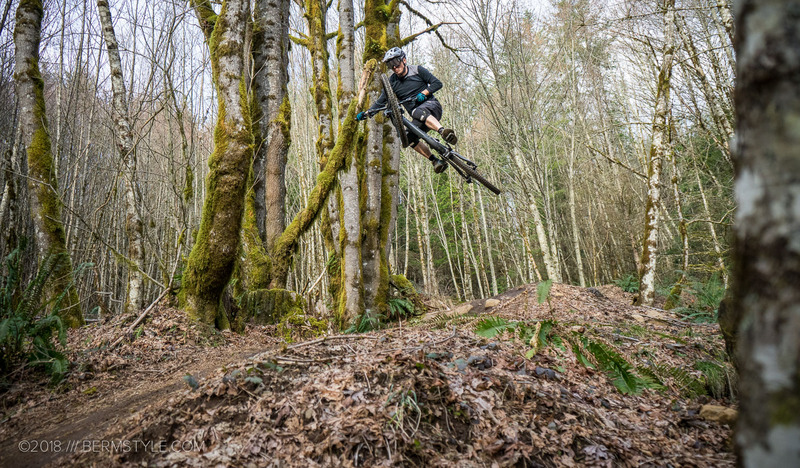 The main difference is that we have more shuttle-friendly trails in the PNW, which means we’re riding higher speeds and getting a lot more descending time every weekend. Looking back though, the reach on my primary trail bikes has been closer to 420mm than my current reach of 450mm, making my current ride the outlier. The Kona Honzo CR in large features a 475mm reach. I’m also riding a frame with a long reach to see what the large Sentinel would have ridden like — a Kona Honzo, size large. The large Honzo has a 475mm reach and while it feels awesome on long, pavement to dirt rides — it climbs like a beast — it feels big and I don’t like taking it on larger jumps. I can confidently say it now – I would have sold that large Sentinel to acquire a medium. I dodged a bullet there. I’m still trying to dial in the Honzo. For comparison, I’ve ridden the medium as well and it feels great. But I’m not sure I need another bike sized for hitting jumps, as I have that covered already. For the time being, I’m experimenting with the bar height on the large Honzo. I recently swapped the bars for taller ones and it feels more all-arounder now; the taller bars have lost some of that “XC” fast feeling, but its much easier to manual, and since I like to break those out constantly, I might keep the tall bars on it through winter, then move back to the low rise carbon bars in the spring. Sizing is all over the board, and not just with bike frames. From tops to gloves to bikes, it seemed a safe bet to select a size medium size. Unfortunately that rarely is actually the case. Buying a shirt or jersey, gloves or pads? I’m anywhere from a small to a large depending on the brand, fit and their target demographic. Fortunately, demo days put on by bike manufacturers are becoming common these days, making it possibly to get a real ride in on different bikes before putting down your hard-earned cash. The better shops also offer demos, often letting you put the cost of the demos towards a bike purchase. Me? I’m super stoked on my current bike and hope to keep it around for some time.